I had a chance to acquire a new Brompton for a very reasonable price so I took the plunge. A folder was already part of my commuting master plan but I was not impressed by the design of anything other than the Brompton for my use. The Brompton folds into a small, neat package (e.g., drivetrain folds into the middle) and was a reasonable riding machine. Unfortunately, being mostly made in the UK, it was not very affordable in the USA at ~US$1200 (Jan '09). For some reasons unknown to me, Bromptons are much more affordable in the UK, especially with the weak pound. Happily for me, a Scottish friend was home visiting, and agreed to lug one back for me. She even got me a discount from a bike shop she knows back in York. Thanks Jenny M.! 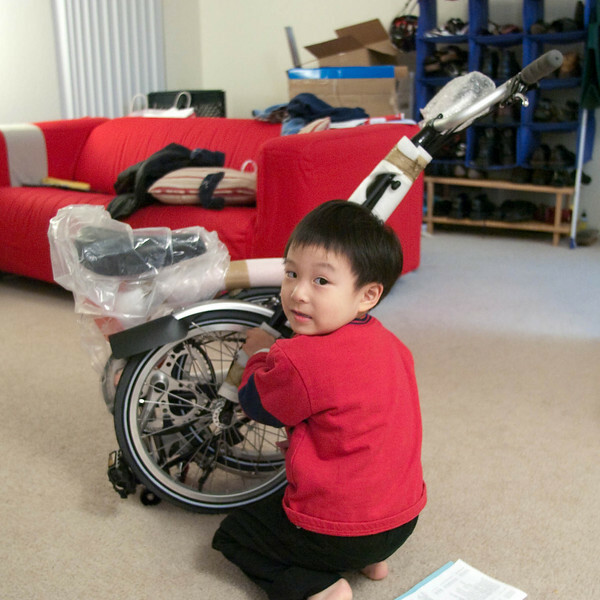 Evan helping with the unpacking of the Brompton.